FlatOut 2 is a racing video game developed by Bugbear Entertainment and published by Empire Interactive and Vivendi Universal Games. 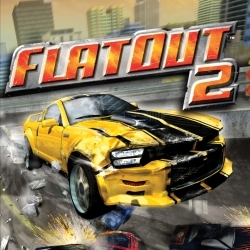 It is the sequel to the 2004-2005 release FlatOut. This game is themed more on the street racing/import tuner scene than its predecessor. Another notable change is the tire grip; players can now take more control of their car, worrying less about skidding in tight turns. The game has three car classes: derby, race and street. ape yg tipu?? kerek mende? ni post bnde² merepek ni nk up kn total post ni! kalau x ape la gunenye thread sharing ni. game ni aku baru cuba...link download mmg mantop laju gile...gameplay die bole tahan la...car crashing die real..bes! leh bgi die pnye sistem requirement ia?. haha..tengok minimum grapik pn dh tau takleh main..